For those of you who never saw the Burma Shave signs, here is a quick lesson in our history of the 1930s, 1940s and even the 1950s. 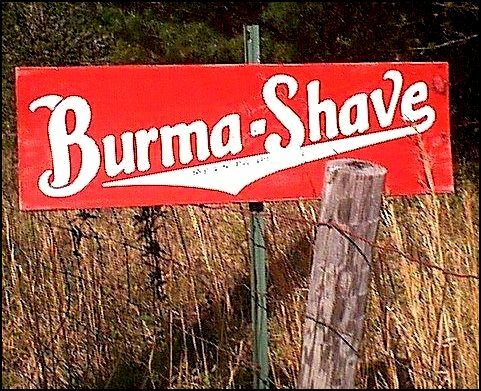 Before the Interstates,when everyone drove the old 2-lane roads, Burma Shave signs would be posted all over the countryside in farmers' fields. They were small red signs with white letters. Five signs, about 100 feet apart, each containing 1 line of a 4 line couplet... and the obligatory 5th sign advertising Burma Shave, a popular shaving cream. Here's a look at some more Burma Shave signs with the Statler Brothers.... Do you remember these?